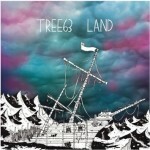 Tree63 returns after seven years and it’s a welcome return. Lead singer John Ellis says, “I hope listeners can take away that sense of ‘thank God, I’m not alone, somebody else feels this lonely and forgotten and hopeful and bewildered and resolved to carry on the journey.’ My own recent experience leads me to the realization that even though we believe we will reach our destination across the hazardous sea God asks us to cross, it won’t be an easy voyage, and often we arrive shipwrecked and battered. The guarantee, however, is that we at least arrive. The band sounds great. (They did win a Dove back in 2000 for Rock Album) The first single “Alive” rocks and I like the chanting. The bass-driven “A Whisper” is an inclusive message of salvation. “Standing On It” has a modern folk vibe. Overall, the lyrics are simple but inspiring and real. “Hard To Believe” is very solid. The record was made, ironically, after a successful “good-bye tour” and then a Kickstarter campaign. Ellis says, “There was absolutely no plan to go back to the band. I was spiritually in a different place and I couldn’t reconcile my future with what I’d done through Tree63. This entry was posted on Monday, August 24th, 2015 at 11:54 pm and is filed under CD Reviews . You can follow any responses to this entry through the RSS 2.0 feed. Both comments and pings are currently closed.